Bernie Sanders pulls closer to Hillary in polls, spends long weekend in Iowa. 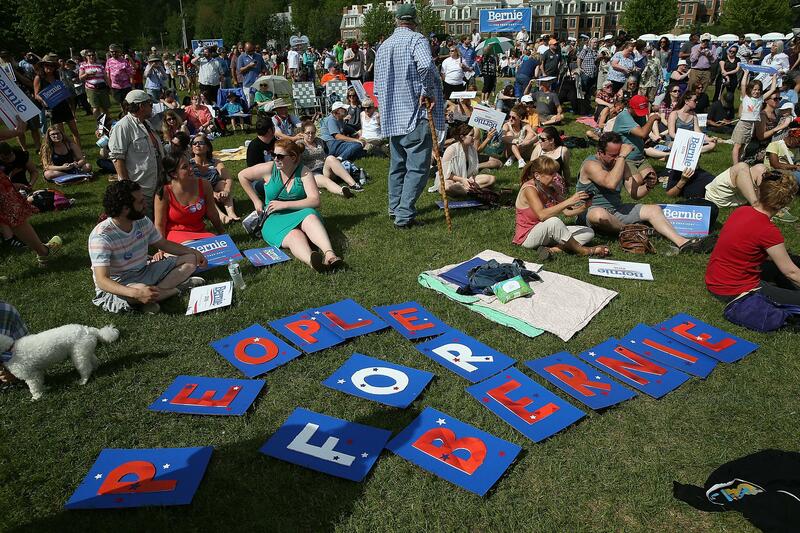 Supporters of Democratic presidential candidate Sen. Bernie Sanders in Burlington, Vermont on May 26, 2015. On Saturday night, Vermont Sen. Bernie Sanders wrapped up a three-day charm offensive that took him through a half-dozen counties in Iowa. He brought standing-room crowds to small-town cafes and his Fourth of July schedule was packed with parades, with hours spent carrying banners with small armies in matching Bernie shirts and shaking hands in a state where his standing in the polls seems to be growing by the day. Sanders didn’t manage to replicate the astonishing turnout that packed his rally in a Madison, Wisconsin arena this week, if only because venues that size are harder to find down in Iowa, but his 2,500-strong crowd in Council Bluffs on Friday is reportedly the largest so far of any 2016 candidate who’s visited the state. Conceding in their headline that “OK, now Hillary Clinton seems to have some problems in Iowa,” the Fix laid out poll numbers showing that Sanders’ impressive crowds seem to be driven by a trend upward in support, at least in Iowa. Clinton still has a 19-point lead over Sanders in the state, 52-33, in the latest Quinnipiac poll, but that’s not great news for a candidate who was ahead by 45 in May. In Lebanon, New Hampshire on Friday, the Union Leader reports that Clinton tried gamely to treat the press corps to ice cream but was met instead with questions about the adoring fans following around her closest competitor, who’s within single digits in some recent New Hampshire polling. Clinton had just come from an event at Dartmouth College in Hanover at which 850 people turned out. The turnout was high for a Clinton campaign stop in New Hampshire this go round, but nothing compared to the reported 10,000 people who turned out to see Sanders at a campaign stop in Wisconsin on Wednesday. Even if McCaskill is right about that, there’s still a cautionary tale in the Ron Paul example: the participatory structure of the Iowa caucuses allowed Paul’s noisy faction to effectively stage a coup on the leadership of the state Republican party in 2012. With a chance that Sanders has both noise and numbers in his favor, and with seven months left for him to win over voters in Iowa, Hillary should resist the urge to be dismissive of his newest fans as extremists and fanatics and start plotting to win them back to her side.